<--> Click to enlarge. 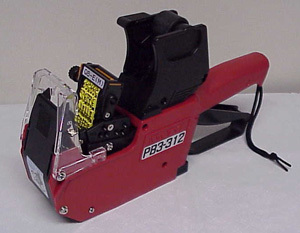 This labeler is used to imprint the Sato-PB312 labels. This labeler imprints, dispenses, & affixes labels, on demand, to the products. These are set to label date due panel of items to be circulated. This label is not sold in the USA, neither are the labels. They come with one set of 8 jumbo characters, two of which are month bands & the remaining characters are numbers. You may obtain other heads customized to your specs or from stock through your sato distributor (except in USA). They are easily installed at your site. Verify that your sato Distributor will provide the supplies for this labeler.